For 27 years now, VinylTec has been a leading source for car interior repair and re-upholstery work. We reupholster car seats, re-carpet interiors, repair cracks in dashboards, repair door panels and offer custom automotive interior work. We pride ourselves on delivering top-notch service to each and every one of our customers and their vehicles. If you are in need of high quality, reasonably priced, expertly-executed repair or restoration for your auto upholstery in Billings, MT, VinylTec is here to provide you with unparalleled service. We are a proud, locally-owned business specializing in car interior repair, leather seat repair and so much more. There’s virtually nothing we can’t do to reinvigorate your vehicle’s upholstery and we take pride in providing results that restore cleanliness, value and appearance to your interior. From simple repairs to comprehensive restorations, no job is too big or small. And because we value you as much as you value your pocketbook, we promise to do it all in a cost effective manner. We are a locally-owned and -operated small business in Billings, MT. Our business has been serving the greater community for nearly 30 years now. 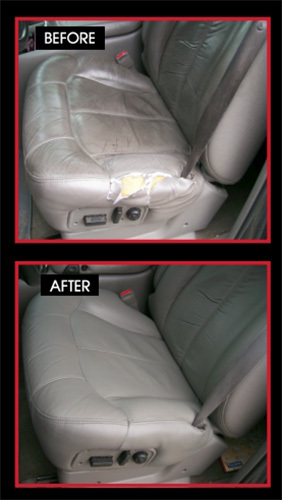 We specialize in car re-upholstery, leather seat repair and more. Our team is friendly, experienced and hardworking. Please get in touch with VinylTec today to learn more about our helpful services and affordable rates. We’re happy to provide you with a free estimate on your project.